For your information, ghosts get to choose their ghost names when they become ghosts, so it’s not our fault her name is kinda dumb. …But Victor totally came up with the name, so blame him. Anyway, it’s grown on me, as have these characters already. Especially the two of them interacting as a pair. Anyway, Floyd really has to pull on that tropical shirt there, he can’t be seen without it. Wouldn’t want to be conspicuous or anything. The baddies that wear different clothes or have hair always end up going on adventures, you know. I think I’m going to like Ecta and Floyd. I can’t help but notice a resemblance between Skaerva and the ghosts. It’s even more apparent with Ecta, who has the same long face and wild hair. Are the ghosts all relatives that ran out of respawns? You might think that, but no, these guys aren’t related to Skärva except maybe distantly – and even if they were, if their name isn’t Tiberius Skärva they would have been a normal human. Ultimately I just like drawing wild hair and that kind of face. But also, all of these ghosts are old souls, quite literally, that have turned up at Castle Skärva for various reasons – some of them are even left over from the time when the Skärvas weren’t known for being so evil and employed more humans, and they still work there after death because it was their home in life. If a spirit doesn’t move on to the afterlife, it’s for a reason – either because they didn’t want to, or the gods kept them out: because they felt the soul had missed something crucial from their time in the world, or for darker reasons. When a spirit is new, it still holds the form it had in life quite solidly, retaining color and enough substance to even wear clothes and accessories if it wants, the very recently deceased sometimes even being able to pass off as living unless you try to touch them. Young ghosts are still usually off gallivanting around, spooking people and seeing the world from a new angle before they settle down. As ages pass, the soul’s form loses the cohesiveness its body had once supplied, becoming a bit squishier and more flexible, but in the same process becoming blander, more blurred – the legs gradually fade into wisps, merging together into that ghostly tail, and the face gradually loses its distinctiveness because ultimately, faces never mattered. Luckily ghosts keep the hairstyle they died with (so you better make sure not to die after a fail trip to the barber’s): as time goes on that becomes the only way to really distinguish them. hey wasnt floyd from the first temple? with the mage with the short fuse? Floyd is too tall to work at the Temple of Terror. NPC has different sprite? IMPORTANT. I learned so much from Paper Mario. Oh but I would like to point out that Ecta and our fishy friend, name yet to be revealed, don’t make any special efforts to distinguish themselves, yet they are still important. While it’s a nice bit of irony that Floyd ‘s irreverent attire is due to him being a slacker with little regard for authority, yet by the power of tropes that’s going to make him significant and therefore have to go out of his way. is Floyd the only minion with hair? No, the others just keep their hair tucked up under their hoods like they’re supposed to. 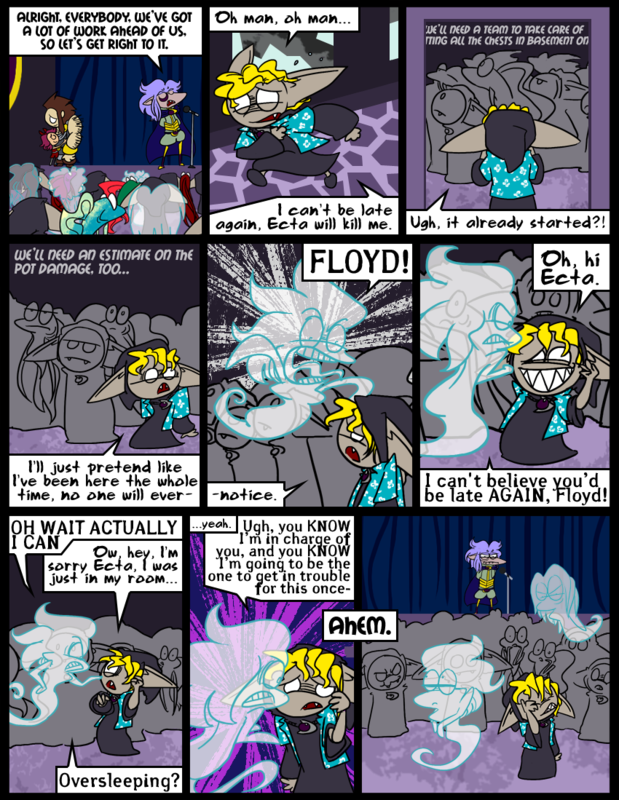 Ecta and Floyd, you just showed up and you’re already in trouble! I think I’m going to like ’em. Btw, Floyd’s expressions are priceless. Thanks. Floyd is priceless overall. I just love him. I’m glad you like his expressions because again, a character with no pupils, you have to work extra hard sometimes. Ah yes, I love them both and I’ve been thinking about them a lot recently. Early into the comic’s life, Victor decided we should have a few lower-ranked minion characters to give a different perspective on everything that Skärva does, and it was a great idea. I’m excited to start following them, parallel to keeping up with LSD (Oh man, great abbreviation for the main trio there. Or DSL if you want). When the overlord is talking, the only “person” the overlord should hear is himself.